Cut and Fold Subway Sketchbook is 8 different subway car paper models from 8 of the worlds metropolis. Cut, fold, glue and bam! You have created your own minia- ture subway model car. From the late 70s until today, these subway car models have served as the canvases for the most explosive art movement of our times. While the kings of graffiti go through great trouble putting their art on trains, these formats are now available to everyone. Fun for train enthusiasts and graffiti fans of all ages. Cut and fold your own little subways, perfect your sketches, re-color the subway designs. Only the imagination sets the limits. 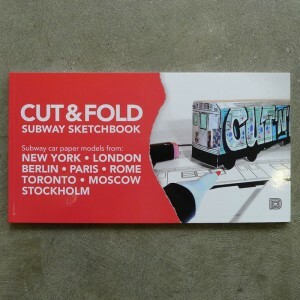 Cut and Fold Subway Sketchbook contains 4 subway car paper models of each model – if you mess up with the crayons on your favorite model, just start with another one. AU$20.95 Out of stock. Request.